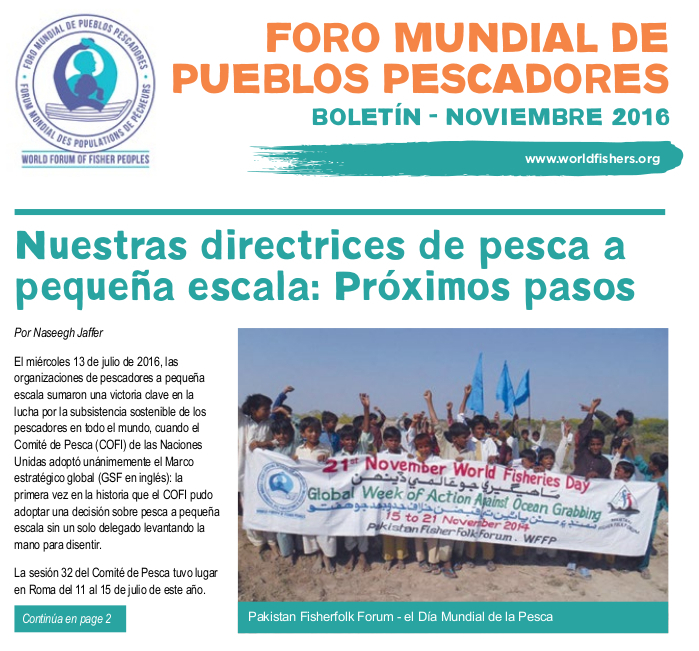 During the past days, leaders of the World Forum of Fisher Peoples (WFFP) have gathered in Pondicherry, to discuss the main challenges facing fisherfolk across the world and how to confront these challenges. The leaders of the WFFP traveled from the Caribbean, Honduras, Canada, Mauritania, Kenya, South Africa, Sri Lanka and Pakistan. A key strategic decision at the meeting was to hold the coming 7th General Assembly of the movement in Delhi, India in 2017, the year of WFFPs 20th anniversary. 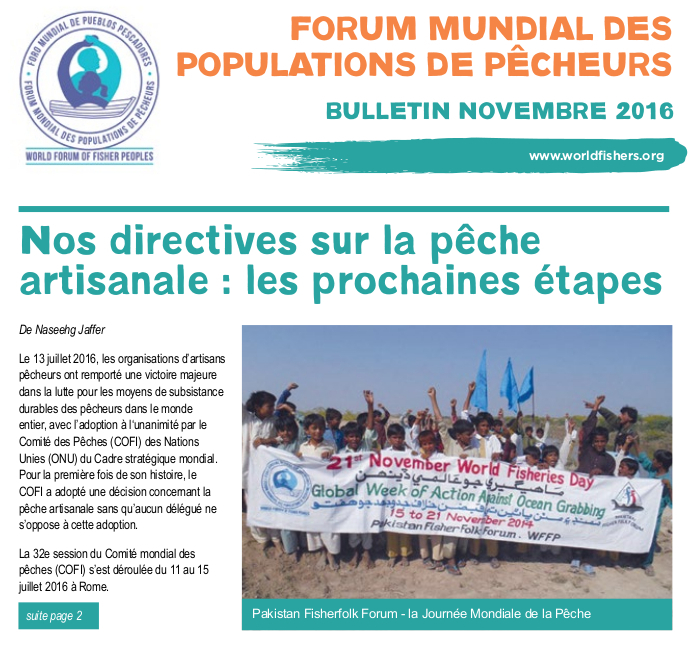 The WFFP is now a global fisheries movement representing 40 million people in 37 countries. The gathering of the World Forum of Fisher Peoples in Pondicherry decided on the following resolutions. We insist that a permanent solution be found to the issue of fishermen incarceration due to crossing national border and entering the territory of neighboring nations, in the case of the South Asian context. Promises for release of arrested fishermen are not sufficient, and it is important that a policy decision should be arrived by these South Asian countries – India, Pakistan and Sri Lanka – that no arrest will be made of fisher people who have crossed border while fishing for their livelihood. We commit ourselves to intensify the demand that the provisions of the UN law of the seas be seriously and fully implemented by the countries with adjoining sea borders, especially in the South Asian context. We realize that Ocean Grabbing – in the form of privatisation of coastal lands and Marine Protected Areas – is a very serious threat affecting small-scale fishing communities in almost all the countries with sea front. We therefore demand that serious and implementable action should be taken by the concerned governments against Ocean Grabbing by the corporate profiteering interests. On the issue of Indian fishermen who were shot at and killed by the Sri Lankan navy, the number is escalating and since 1984 and exceeded 600. The unfortunate truth is that the families of these fishermen who had been fishing for livelihood are not compensated sufficiently so that the children could continue with the education. We demand that sufficient and justifiable compensation be made to the families of these fishermen by the concerned governments. The meeting further adopted a programme of action that aims at building capacity of small-scale fishing communities in order to facilitate the implementation the International Guidelines on Sustainable Small-scale Fisheries adopted by Committee of Fisheries of the United Nations. 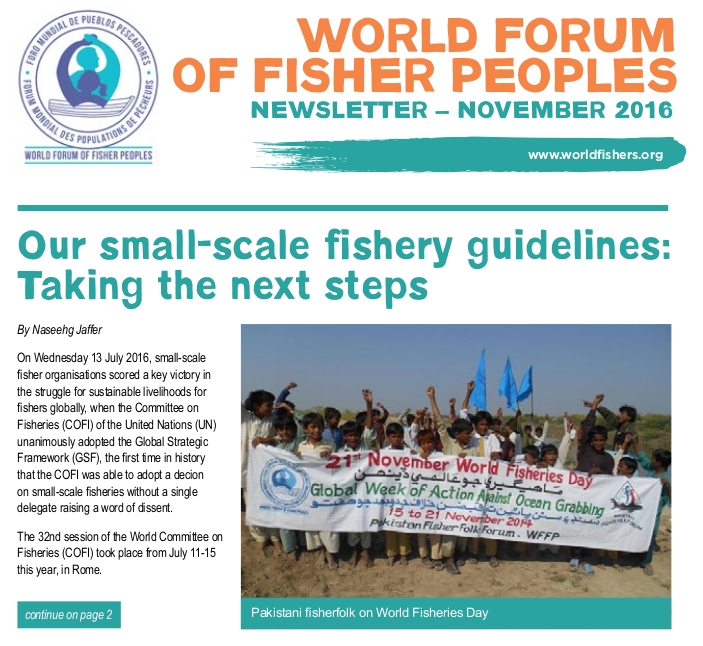 We are convinced that these guidelines will bring social justice and economic development to small-scale fishing communities in India and across the world. Issued on behalf of the WFFP Coordinating Committee by the Secretary General Mr. Naseegh Jaffer.